Quantity of paste is for 2 large mackerals, adjust according to quantity of fish. 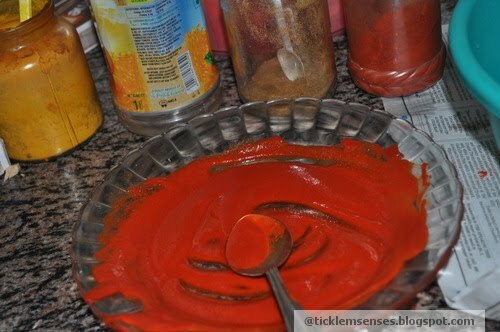 1.Take all masala ingredients in a bowl, add water to make a shiny paste. Do not make runny or too thick. Marinate cleaned fish with the paste for 1/2 hour. Make slits in fish to allow masala to seep into the flesh. 2. To fry: In a hot tawa heat sufficient vegetable or coconut oil to almost smoking or very hot. Place fish carefully in oil , reduce heat slightly and do not move fish till done on that side. Then turn over and cook the other side. Add more oil as require to prevent the masala burning. 1. Grind all the above ingredients in vinegar to form a thick paste. Bottle the prepared masala paste in a sterilised dry airtight bottle and store in the fridge for a few months. Use a dry spoon as and when required. Remember to close the lid tight after use.